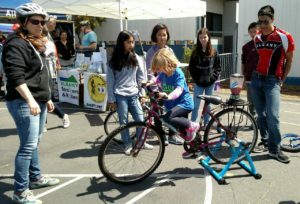 What would Bike Month be without a few events for the kids? We hope you and your family will join us on Bike to School Day. Most schools will celebrate on this date, and every school will do its own thing. If you are involved with a school and have details please email us and we will post it here. Keep an eye on this space and/or contact Ken at kenmccroskey@gmail.com for information. Come join our annual rolling party, Bike to Work Day! 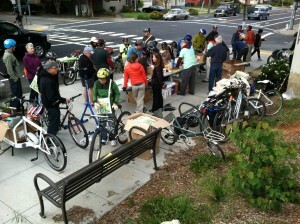 Join us for the 25th Annual Bike to Work Day in the Bay Area, a party on wheels!! 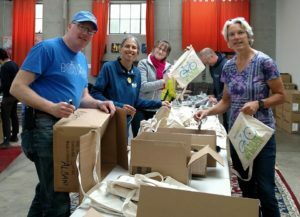 As usual, there will be coffee, food, swag, bike goodies in the famous Bike to Work Day musette bags, fun and lots of good conversation & information so come on down on your way to work! Here’s a short VIDEO that AS&R member Francesco Papalia took so you can see how fun the morning is! Don’t miss rolling down to see all your friends and neighbors! The staff of Blue Heron Bikes and Berkeley Bikes & Skateboards will be volunteering their time, checking your bicycles for safety and road-worthiness as they have in previous years! Thanks to owners Rob Allen & Winston Jamison for spending time with us all! Local business Kim’s Cafe (thanks, Cathy!!) and Royal Ground Coffee (thanks, Mike!) are again donating home made pastries & beverages for our Energizer Station. Trader Joe’s El Cerrito, Barney Butter non-GMO almond butter from the Central Valley, Semifreddi’s in Alameda and GU Energy in Berkeley are also giving us generous donations. Safeway on Solano and Sprouts at University Village are donating gift cards for groceries, too! SO YES, WE NEED YOUR HELP IN DISTRIBUTING ALL THESE GOODIES TO 600+ CYCLISTS! Local businesses BLUE HERON, BUA LUANG, TAY TAH CAFE AND FERN’S GARDEN ARE ALL DONATING SPECIAL GIFT CARDS OR COUPONS FOR OUR BIKE MONTH VOLUNTEERS, IN APPRECIATION FOR YOUR TIME AND SERVICE TO THE COMMUNITY!!! Plenty of food and drink for everyone, but we could use people to pick it up and hand it out! WE WILL NEED HELP AT OUR ENERGIZER STATION BEGINNING AT 6:30 a.m. through wrap-up at 9:30, as well as preparing for a big celebration. We will need help stuffing the musette bags with goodies beforehand, picking up food & coffee early morning on the 10th, and handing out swag, food and counting cyclists all morning at the Energizer Station. Want to help get donations of food, beverages or $ for food & bevs? If so, please contact Ken McCroskey at kenmccroskey@gmail.com or Amy Smolens at calamari@alumni.duke.edu or leave a comment on this post. 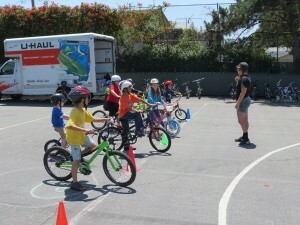 School kids learn how to cycle safely and have fun doing it, while following the rules of the road. Bring your kids to Albany Police Activity League’s Annual Bike Rodeo! Albany Strollers & Rollers contributes by fitting helmets, offering local cycling information, and hosting bike-blended smoothies for all, so everyone can pedal-power a delicious smoothie! 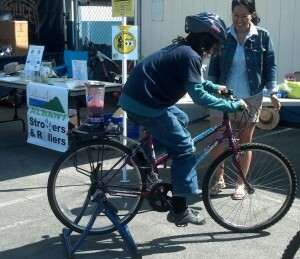 Bicycle + fruit + blender = delicious fun!! Want to help like Tenisha is doing here? Email Ken! We’ll also have our “Check for Bikes” clings and stickers on hand for parents, our Reflective Leg & Arm Bands for all, and will be available to talk to kids and parents about biking and walking in and around Albany! PLEASE VOLUNTEER: AS&R relies on volunteers to help run the bike blender station, fit helmets, and engage parents & kids about cycling in Albany. Volunteers get our undying gratitude and a special thank you gift. Local businesses BLUE HERON, BUA LUANG, TAY TAH CAFE AND FERN’S GARDEN ARE ALL DONATING SPECIAL GIFT CARDS OR COUPONS FOR OUR BIKE MONTH VOLUNTEERS, IN APPRECIATION FOR YOUR TIME AND SERVICE TO THE COMMUNITY!!! Please contact Ken McCroskey to help out!! Kids, don’t try this at home…just yet! Berkeley Sunday Streets @ Shattuck from Rose to Channing, and continues on Durant to Telegraph. The streets are closed to cars and open to YOU – get out and enjoy!! Get out and connect with your community and urban environment in a transformative way! Sunday Streets (also called “Open Streets”) closes streets to automobile traffic for a day so that people may use the space for other physical and social activities. The streets become parks as people replace car traffic. People walk, bike, skate and dance and play. Everyone from businesses and community organizations to musicians and artists use the space creatively, engaging the public and providing spontaneity and discovery. This temporary public space inspires creativity and change for the better, on that day – and beyond. The first Sunday Streets Berkeley was on October 14, 2012. More than 42,000 people came to Shattuck Ave to stroll, skate, cycle, dance, play in the street. People came from all over the Bay Area to experience Berkeley anew. Local Berkeley businesses reported a 30-50% increase in sales on the day of the event. 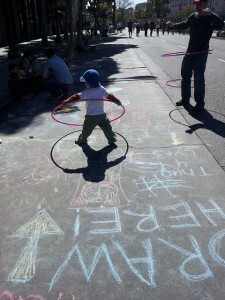 The first-ever Sunday Streets Berkeley was by all measures a great success. Previous routes have been expanded – Sunday Streets now runs the length of Shattuck from Rose to Channing, and continues on Durant to Telegraph. Here’s an interactive map of Sunday Streets activities. 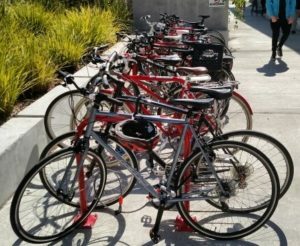 Hundreds of people from all over the Bay Area take advantage of our Bicycle Valet Parking service at two lots on Solano Avenue. Please volunteer a few hours before enjoying the event! Thanks to Floor Dimensions for donating the Red Carpet to show the way! We’ll also have an information table by our western lot near Masonic. WE NEED YOU TO MAKE THIS A SUCCESS! 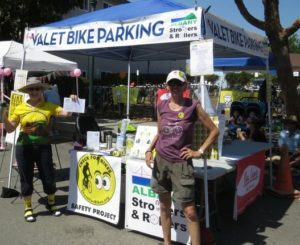 If you’d like to help park bikes (we parked 300+ last year!!) at either lot or volunteer at AS&R’s info table, please contact Amy Smolens or Sylvia Paull. This is a great gig for kids, too, as long as they are strong enough to roll a bike. If students need volunteer-hours, this is perfect! AS&R Super-Volunteer Lynn Eve Komaromi takes a well-earned Pad Thai break – thanks, Bua Luang! Please join Lynn Eve and your AS&R neighbors in volunteering! All volunteers who work at least a 4-hr shift or pick up & return rental racks will get free lunch provided by a supporting Solano Avenue restaurants Tay Tah , Bua Luang Thai Cuisine or Brazilian Breads – yum!! Kim’s Cafe is providing home made iced tea at our lower lot. Some sponsoring businesses also provide fabulous gifts or coupons for our volunteers, too! 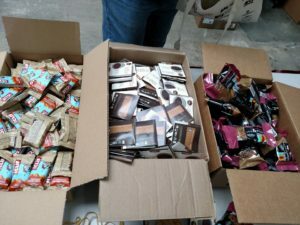 RXBAR has also donated boxes of delicious protein bars (many flavors) for all volunteers and visitors to our AS&R booth! Volunteer hours run from 9am-5:30pm so it’s easy to pick a shift that works for you! 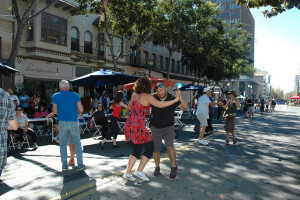 Since 1974 Solano Avenue and the cities of Albany and Berkeley have hosted the Solano Avenue Stroll, the East Bay’s largest street festival! The Solano Avenue Association , AS&R and Check for Bikes invite you to see what makes Solano Avenue a wonderful place. The Stroll features over five hundred vendors including 50 entertainers (there’s always great music!,) 50 food booths, 150 government and non-profit agencies, 150 juried hand-crafters, a 75 entry parade, state of the art mechanical rides and much more! 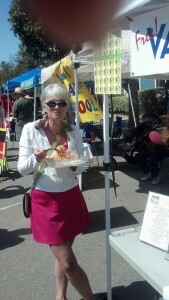 Come visit AS&R at our information table then enjoy a great stroll up Solano! Or better yet, volunteer a few hours with Sherie, Amy and your neighbors before strolling! 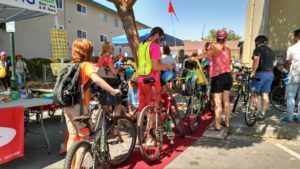 230,000 participants and event guests visit from all over the west coast so that’s where YOU come in – many of them ride their bikes, so we need people to help park them in our lots. Lots of them want to talk about cycling and walking around the area, and they want to talk to YOU! AS&R’s supporting sponsor, Floor Dimensions has donated a long Red Carpet to lead passers-by to our information table and straight up the ramp to our western Bicycle Valet Parking lot! Please see the press room to stay tuned into what’s hot at this years event! Bikes, Bikes, Bikes!! 300 + of them at our two lots so please join us!! 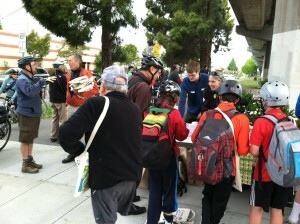 Join us for the 26th Annual Bike to Work Day in the Bay Area, a party on wheels!! 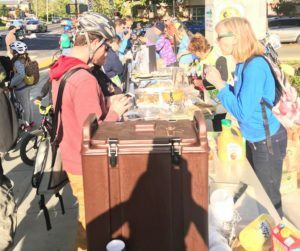 As usual, there will be coffee, food, swag, bike goodies in Bike East Bay’s famous Bike to Work Day musette bags, fun and lots of good conversation & information so come on down on your way to work! We had plenty of food & drink, thanks to our supporting businesses and great volunteers! Semifreddi’s of Alameda is again donating plenty of freshly baked rolls & buns for all of you! We’re also getting generous donations from Kim’s Cafe (thanks, Cathy!!) & Royal Ground Coffee (thanks, Mike!) 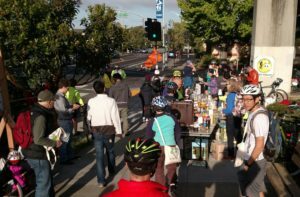 , Trader Joe’s El Cerrito, Noah’s Bagels, Safeway on Solano, Safeway Community Market and Sprouts at University Village so all the passing cyclists had plenty to eat and drink. We hope to have plenty this year, too! Got any ideas for donations? Let us know! Local businesses BLUE HERON, BUA LUANG, TAY TAH CAFE , FERN’S GARDEN and BIKELINK (that’s the list so far) ARE DONATING SPECIAL GIFT CARDS OR COUPONS FOR OUR BIKE MONTH VOLUNTEERS, IN APPRECIATION FOR YOUR TIME AND SERVICE TO THE COMMUNITY! WE WILL NEED HELP AT OUR ENERGIZER STATION BEGINNING AT 6:30 a.m.
Lots of food and drink for everyone, but we could use people to pick it up and hand it out! through wrap-up at 9:30, as well as preparing for a big celebration. We will need help STUFFING THE MUSETTE BAGS with goodies, soliciting donations, shopping beforehand, picking up food & coffee early morning on the 9th, and handing out swag, food and counting cyclists all morning at the Energizer Station. If so, please contact Elizabeth Vahlsing at evahlsing@earthlink.net and Amy Smolens at calamari@alumni.duke.edu or leave a comment on this post. Stuffing bags for everyone who rolls by is FUN!! If you can help, please email Elizabeth at evahlsing@earthlink.net – thanks! THIS EVENT IS TAKING A PAUSE IN 2019 – LOOK FOR IT TO COME BACK IN 2020! We’ll also have our “Check for Bikes” clings and stickers on hand for parents, including our new Youth versions, our Reflective Leg & Arm Bands for all, and will be available to talk to kids and parents about biking and walking in and around Albany! 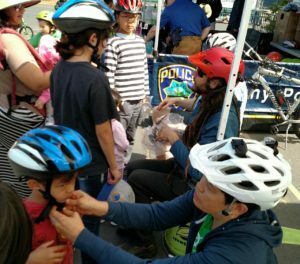 PLEASE VOLUNTEER: AS&R relies on volunteers to help run the bike blender station, fit helmets, and engage parents & kids about cycling in Albany. Volunteers get our undying gratitude and a special thank you gift. 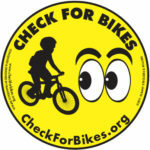 Pick up some of our NEW YOUTH VERSIONS of Check for Bikes clings and stickers! 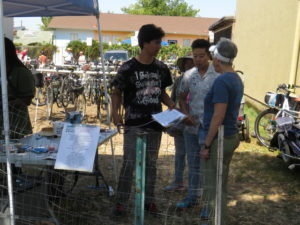 Last year local businesses BLUE HERON, BUA LUANG, TAY TAH CAFE AND FERN’S GARDEN ALL DONATED SPECIAL GIFT CARDS OR COUPONS FOR OUR BIKE MONTH VOLUNTEERS, IN APPRECIATION FOR YOUR TIME AND SERVICE TO THE COMMUNITY – expect something similar this time!!! Please contact AS&R’s Core Group to help out!! The City of Albany’s Recreation Department is getting into the spirit of Bike Month with a Bike in Movie! 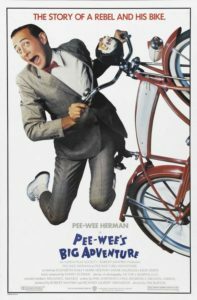 They will be showing “Pee-wee’s Big Adventure” (PG), a family-friendly comedy about one man-child’s cross-country adventure in search of his beloved stolen bike. It’s a bizarre story of perseverance and hope in times of adversity, and is chock-full of zany characters. Ride your bike on down to the Albany Community Center and join us for this fabulous Bike Month event! There will have plenty of space to park your bike in a protected area, complete with a massive bike rack. The popcorn is free and will be flowing freely!